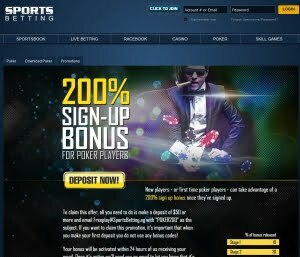 Sportsbetting Poker is a poker room on the Revolution Gaming Network, one of the few remaining poker sites that focus on US players. The site has been providing US sports bettors with the same high-quality service since 1998, which dates way back to the beginning of the gaming industry. This site was on the Cake Network in the past before migrating to Revolution Gaming, meaning it you are guaranteed of unshakable security plus a steady stream of gaming traffic to keep things even more interesting. They poker room also offer some serious tournament cash, with a pot of $160k guaranteed every month. [TST], meaning it comfortably offers a fair game to the thousands of gamers who log in during peak hours. Once in the lobby, you’ll find it quite easy to locate whichever games tickle your fancy, of which there is a wide range provided around the clock. The range of games at Sports Betting Poker is quite huge, with real money ring games being availed as well. This includes Texas Hold’em, 7 Card Stud, Omaha [with the newly introduced Omaha Hi Lo], as well as 7 Card Stud Hi Lo. The Omaha tables offer No Limit, Pot Limit and Fixed Limit. An interesting aspect with the games at Sports betting Poker is that, where most sites have virtually all their action at 6-max tables, most of the betting action is on this site is at 10-seat full ring tables. While you are playing, you can automatically earn POP points [one POP Point per $.10] which are the keys that will get you into the POP2Cash tournaments that happen every week. This however, only accounts for just one aspect of several free-roll prospects offered by SportsBetting Poker, as there are even free-rolls offered almost every hour of the day. There isa weekly $10,000 guaranteed tournament that is super soft. There are also various kinds of seasonal promotions that are based on holidays and live events. SportBetting Poker may not throw cash around as much as the biggest sites but you can be sure to find big special events and promotions throughout the year that will make it easy to pad your wallet. Another huge benefit when playing at SportsBetting Poker is that it’s quite easy to win, short term or in the long run. With a steady stream of casual gamers dropping in from the casino and sportsbook sections within the network, you’ll find plenty of fish to play against. Add the huge bonus offers and you are in gaming heaven. As such, ensure you qualify for the 25% for life bonus. Right now is the time to get on board if you want to take advantage of the soft traffic before the sharks can realize what they’ve been missing. Sign up for a free account today, make a deposit and you are ready for the bonus cash. Once you have signed up for and verified your account, you are ready to fund a SportsBetting account. The deposit options are the same regardless of where in the world you live and you may opt for Amex, MoneyGram, Visa, Western Union or even a Bank Wire transfer. 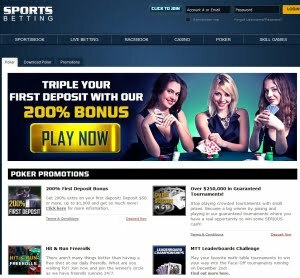 And depending on whether you’re looking to take advantage of the Sportsbetting sportsbook bonus or SportsBetting poker bonus, you must enter the appropriate promo code when making the deposit. SportsBetting Poker is a new entrant to the online poker market. It runs on a popular network that gives it a solid player base with easy, safe and secure deposit methods and a range of cash out options. You can get a $500 bonus as a new player.